It’s like the meetings that are bad (and all too common) age you in dog years. Why don’t more meetings take full advantage of the collective brainpower and perspectives in the room, across the webcast, or on the conference line? 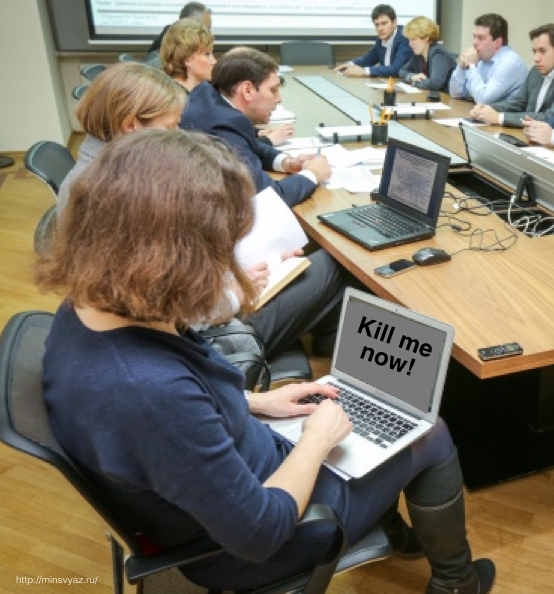 IOW, why aren’t all (or even most) meetings meaningful? Simply asking two questions will go a long way toward resolving the issues that make for a meaningless meeting. What are the desired outcomes? IOW, what should participants understand and/or do better as a result of the meeting? Sometimes, too, a meeting’s desired outcomes might extend beyond knowing and doing to include influencing feeling — the classic pep talk is but one example. Is meeting necessary? How will participants’ being together (physically or virtually) enhance the ability to achieve the desired outcomes? Addressing this question may naturally lead to the question: is meeting together even necessary? If you care to join me in my quest for universal adoption of my New Year’s Resolution to make meetings more meaningful, address these questions and/or insist (in the ways that you can) that meeting organizers address these questions. We are all busy. Our time is precious. Is it too much to expect that interactions are meaningful and worth our time and attention? Yes, even meetings.